The ballgame, in all its myriad forms, is one of the most iconic and pervasive cultural traditions of Mesoamerica. What a spectacle these games must have been, with skilled athletes manipulating a heavy rubber ball using only their hips and thighs, engulfed by the cheering roars of a jubilant crowd as a good shot was made or a bet was lost. We know from the Spanish chroniclers who witnessed these games that they were in fact games of entertainment and competition. Yet over the years, scholarship on the Mesoamerican ballgame has increasingly leaned towards the position that these games were acts of elite political theater; that is to say, moments of carefully crafted political display where rulers conveyed their status, power, and deep ritual knowledge to a suitably impressed public audience. Such political stage craft should not be ignored, for it affects games even to this day. Campaigning politicians never miss a chance to take a shot with a basketball, or show their support for a winning local sports team, but we would never imagine that they control these games. Recent discoveries made by archaeologists working in the Mexican states of Yucatan and Oaxaca serve to remind us that the Mesoamerican ballgame was indeed a game enjoyed by all and not the sole province of political elites. The authors of this post have had the fortune to be a part of multiple archaeology projects in these regions, though the information presented here is in large part the result of the hard work of many of our colleagues in both Mexico and the United States. In addition, Stoll has spent many hours carrying out ethnographic studies among modern ballplayers, particularly observing games of pelota Mixteca, a contemporary descendent of the ancient Mesoamerican ballgame. Together these archaeological and ethnographic data present a new picture of the ballgame – a picture that emphasizes the communal importance of sport, competition, and, dare we say, play. New evidence on the role of the ballgame from Yucatan, Mexico, first began to come to light in the spring of 2000, when Proyecto Costa Maya (PCM), under the direction of Fernando Robles and Anthony P. Andrews, initiated an archaeological survey in Northwest Yucatan. Over the course of the next three years, PCM encountered a total of 25 previously unrecorded examples of ballcourt architecture. Unexpectedly, all of these examples were found at small settlements with no evidence of significant elite presence. Even stranger was the fact that surface collections and exploratory test pits suggest that these ballcourts date to the Middle Preclassic period, well before state-level elite actors had appeared in the Maya world. As work continued in the region, archaeologist Edgar Medina had the chance to carry out more detailed excavations at yet another ballcourt at the site of Xanila, further confirming the Middle Preclassic date of these examples and also identifying an early form of a ballcourt marker at the center of the playing field. The small size of the settlements where these ballcourts were found, as well as their association with an early and less socio-politically complex period of Maya culture history, flew in the face of the traditional paradigm of the Mesoamerican Ballgame as an act of elite political theory. As a result, archaeologists working in Yucatan were forced to consider the possibility that the ballgame had originated without elite guidance. In the meantime, archaeological work on Postclassic sites in the state of Oaxaca was leading archaeologists to similar ideas. The Proyecto Arqueológico Nejapa/Tavela, directed by Dr. Stacie King in Oaxaca, documented 15 previously unrecorded examples of ballcourt architecture. 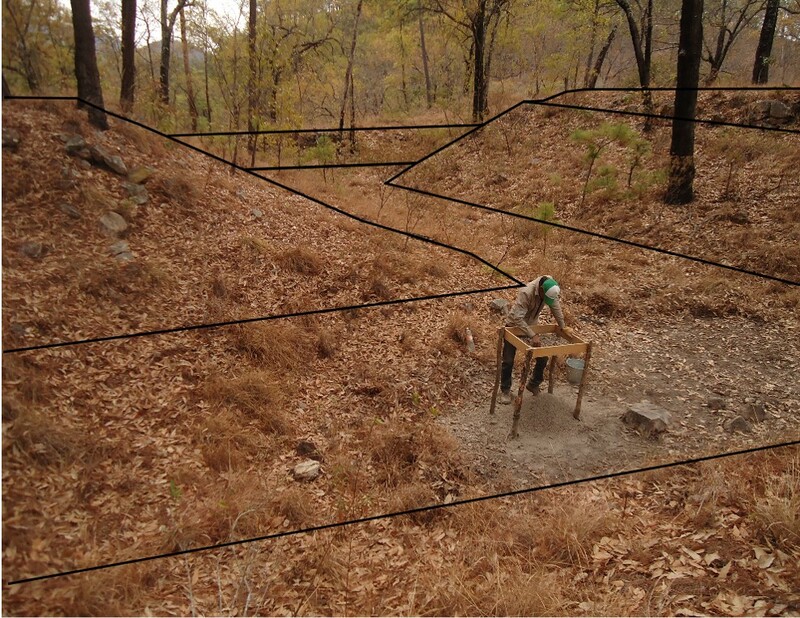 These structures were found at a range of different sites, including major, minor and even isolated sites where the court was the only architecture present. Clearly, there were games that occurred outside of centralized elite control. Yet, the presence of these courts in boundary communities suggested the games may have occurred between different social groups. Given the dramatic social and political changes that were occurring in the Nejapa region at this time, the ballgame may have been a way to integrate social groups together and to resolve conflict between communities. Inspired by the discovery of a small ballcourt at the minor hilltop site of El Palmillo, constructed during the waning days of Monte Alban’s power in the Classic period, Stoll developed an ethnographic research project on the modern ballgame pelota Mixteca. As she observed games and got to know the players from different communities she noted the many ways in which the game functioned to build and sustain local communities, particularly in terms of competition between communities. The majority of these games were organized outside of the authority of traditional power structures. Many of the informants told Stoll that they played not only to build friendships, but also because the game was a fun diversion for them. These results further suggest that we should seriously consider the social role of the ballgame, rather than simply focus on its elite function. While a great deal of evidence exists for the perspective that elite actors in Mesoamerica involved themselves in the ballgame for political purposes, this does not negate the existence of communal traditions of ball playing, nor the fact that sport can act to build and maintain community social organization outside of elite control. We believe that these new data help to demonstrate that the communal role of the ballgame was often more important than the elite machinations that went along with the game. Playing ball was, and continues to be, a part of what it means to be Mesoamerican. A more detailed treatment of this research will appear in the book “Prehistoric Games of the North American Indians: Subarctic to Mesoamerica,” edited by Barbara Voorhies.